Blessed are our brothers who have already been set free from the snare of the hunter, who have crossed over from the tabernacles of the militant to the courts of peace. Once the fear of evil has been put aside they are singularly lifted up to hope. To one and all is said, No evil will befall you, no scourge come near your tent. (Psalm 91:10) This is a great promise, but what gives me the right to hope for it? How do I evade both evil and the scourge, how do I fly away, how might I go so far away (Psalm 55:6) that they will not draw near to me? What merit, what wisdom, what virtue will carry me to this? 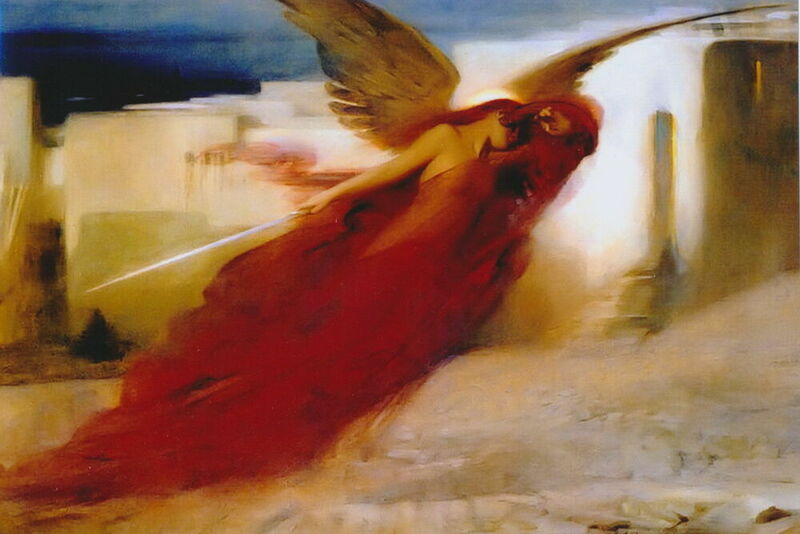 For he has given his angels charge of you, to keep you in all your ways. In all ways? What ways? Those by means of which you depart from evil, (Psalm 37:27), those by which you fly away from the wrath to come. (Matthew 3:7) There are many ways and many kinds of ways; indeed, there is great danger for the wayfarer. When there are so many hostile ways, how easy it is for us to wander in our own path (Isaiah 47:15) if we lack the ability to discern ways. But God has not given the angels their commission to preserve us in all possible ways, but in all our own ways. Yet there are some journeys from which, rather than in which, we need to be protected. Let us search our ways then, brothers. Let us also track the ways the demons, the ways of the blessed spirits, and the ways of the Lord. . . . But consider also the manifest visitations of the Lord, how in him who is now eagerly anticipated we have a compassionate savior, and how for the future we are sustained in him who is promised for the end of time as our truthful judge. This seems clearly expressed in the saying, For God loves compassion and truth, the Lord gives grace and glory. (Psalm 83:12) However recollected Christ might have been in the prior visitation of his compassion and truth to the house of Israel, (Psalm 98:3), in his final visitation, although he will judge the destitute of the world with balance and the people in his truth, (Psalm 96:13), he will not judge without compassion, except those who were themselves clearly not compassionate. (James 2:13) These are the pathways of eternity, concerning which you have from the prophet, The hills of the world are scattered by the pathways of his eternity. (Habakkuk 3:6) Here, from scripture, I am easily able to prove this: The mercy of the Lord is from everlasting to everlasting, (Psalm 103:17) and, The truth of the Lord endures forever. (Psalm 117:2) The hills of this world have been made low by these journeys of the soul. These hills are the proud demons, the rulers of this world (John 12:31) and of its darkness (Ephesians 6:12) who do not know the way of truth and compassion or remember their side alleyways. Who can intervene between those hills and truth? Only a liar and the father of lies. (John 8:44) And further, concerning these things you have it clearly written that there is not truth in him. (John 8:44) Truly, how far the father of lies was from mercy is given witness by our own misery that is inflicted upon us by him. When could he ever have been compassionate when he was a killer of humanity from the beginning? And finally, If a person is worthless to himself, to whom will he be good? (Sirach 14:5) A person is most cruel to himself who never is saddened by his own sinfulness, whose conscience is never pricked by his own damnation. Their false presumption has thrust them [such persons] off the path of truth, (Wisdom 5:6), their cruel obstinacy has shut off the path of mercy. They will never be able to attain this compassion on their own, nor receive it from the Lord. (1 Corinthians 7:25) It is in this way, then, that those swollen hills have been scattered by the pathways of eternity as they have turned away from the straight ways of the Lord (Hosiah 14:10) and have been bowed low through their winding and digressive steps that are not so much spiritual journeys of the soul as precipitous descents. But how prudently and profitably the other hills were scattered and brought low, to their salvation, by these eternal pathways. For they were not scattered as though they were opposing their own righteousness, but because they were bowed down by the spiritual pathways of God’s eternity. Moreover, do not the hills of the world resolve to bow down when the high and powerful are inclined to the Lord (Isaiah 60:14) as devout subjects and when they adore the vestigial footsteps of God? Are they not bowed down when they are converted from the pernicious haughtiness of vanity and cruelty to the humble side alleyways of mercy and truth? It is not only the paths of the good spirits but also the elect among men and women who are guided in these ways of the Lord. And the first step in the journey for pitiable humanity emerging from the depths of corruption is mercy. (Luke 1:77-78) The divine mercy makes a person extricating himself from corruption compassionate toward the son of his mother, (Isaiah 49:15) merciful to his soul, (Sirach 30:24), and thereby pleasing to God. In this way a soul of mercy imitates the great work of the highest divine compassion, being pierced by compunction and moved to tears with him who was pierced for us, in a certain way dying for his own salvation, sparing himself no longer. This first compassion rescues the person returning to his heart, (Isaiah 46:8), and this first mercy enables the soul to activate the innermost secrets of the heart. It then remains to travel toward the royal road (Numbers 21:22) and advance toward truth, and, as we so often commend you to do, to accompany confession of the lips with contrition of heart. For humanity believes with the heart and so is justified, and confesses with the lips and so is saved. (Romans 10:10) Turned to him in their heart, (Psalm 85:8), it is necessary that one become small in one’s own eyes, just as Truth himself has said, Unless you turn back and become as little children, you will never enter the kingdom of Heaven. (Matthew 18:3) May we not wish to keep secret what we know only too well – that we are reduced to nothing. (Psalm 72:22) May we not be ashamed to bring forth into the light of truth what we cannot see in secret without having been grasped by compassion. In this way humanity is brought along into the ways of mercy and truth, the ways of the Lord, the paths of life. (Psalm 16:11) And the fruit of these ways is the salvation of the wayfarer. That the angels direct their course along these same ways ought to be clear. For when they ascend to contemplation, they search out truth, in desiring which they are filled, and in being filled they long again. But when they descend, they bring compassion to us, that they may guide us in all our ways. These spirits are ministers sent to attend to us. (Hebrews 1:14) Clearly, they are our servants, not our masters. And in this ministry they imitate the example (John 13:15) of the Only Begotten, who did not come to be served, but to serve, (Matthew 20:28), and who sat among the disciples as one who serves. (Luke 22:27) For the angels in contemplation the fruit of their angelic ways is their own happiness and obedience in love. This fruit pertains to us in that through them we grow toward divine grace and are guided in our ways here below. So then, it is said, He has given his angels charge of you to guide you in all your ways, in all your needs, in all your longings. Otherwise, you would run headlong into the ways of death. (Jeremiah 21:8) That is to say, out of necessity you would rush immediately into obstinacy, or out of greedy ambition you would rush into stubborn presumption. Neither are the intended ways of humanity; they are the ways of demons. For when are men or women found to be most obstinate, if not in what they think or pretend to be necessary. “If you warn such a person,” someone has said, “that person will answer, ‘I am able to do what I am able to do, more than that I cannot do. If I could, perhaps I would feel different.’” Why do we leap into obstinacy, if not from an impulse of powerful desire? Meanwhile, God has charged the angels not to move you from your ways but to direct you in them, and through their own ways to guide your ways into God’s. “How do they do this?” you ask. Clearly, just as the angels act form the purest charity alone, so you also, admonished at the very least by your own necessity, descend and condescend. 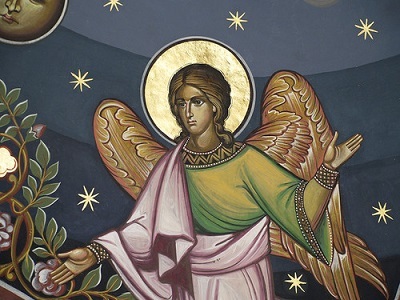 That is, descending, seek to display compassion to your neighbor, (Luke 10:27), and in return, lifting up your desires with those same angels, strive to ascend with all the passionate longing of your soul to sublime and perpetual truth. Thus, in one place we are admonished to lift up our hearts with our hands, (Lamentations 3:41), while at the same time we hear every day, “lift up your hearts.” Elsewhere we are convicted by our negligence and told, Sons of man, how long will you be dull of heart? Why do you love vanity and seek falsehood? (Psalm 4:2) An unburdened and lightened heart is a heart more easily lifted up to seek and love truth. (Psalm 84:12) Do not be amazed that those who deign to guide us do not scorn to ingraft us into God by admitting us with them into the ways of the Lord. But how much more happily do they walk in those ways than we, how much more securely! And yet, though they too are far inferior to him, who is Truth itself and Mercy itself, they hover in the midst of mercy and truth. How suitably God has separately graded these orders of angels to come together each at its own level! Yet God himself is the loftiest principle, supreme over all the orders; beyond God there is nothing, above God nothing. God placed the angels, not of the summit, but in safety near the summit without risk of harm, so that adhering in likeness go God, who does stand at the summit, they may be confirmed by power from on high. (Luke 24:49) Humanity, on the other hand, is neither at the summit nor in safety but on guard, wary, alert. Further, they are on something solid, that is, the Earth, having a bottom but not the lowest place, and thus it is both possible and necessary that they be on their guard. The demons, however, wander in suspension randomly and without principle in the empty, windy air. They are unworthy to climb to Heaven and they disdain to come down to Earth.